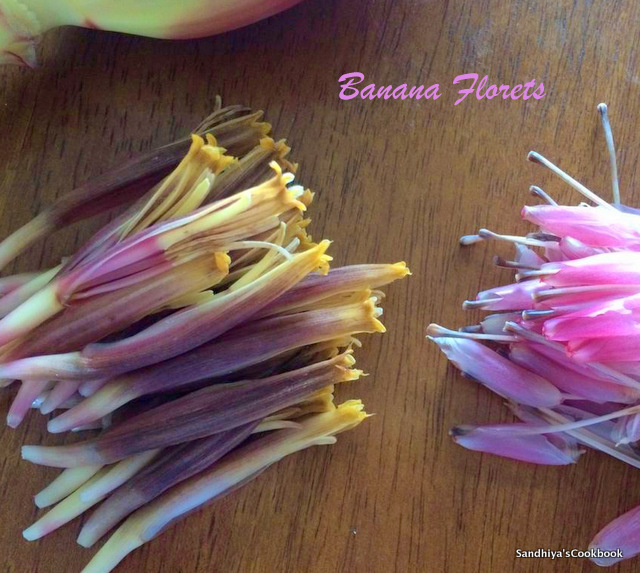 Vazhaipoo/ Banana Flowers are the blossom that grows on banana plant and it's used in south indian cooking a lot. We make usili, kola urundai, vadai,poriyal with banana flower, all are really delicious and we as a family love them in any form. 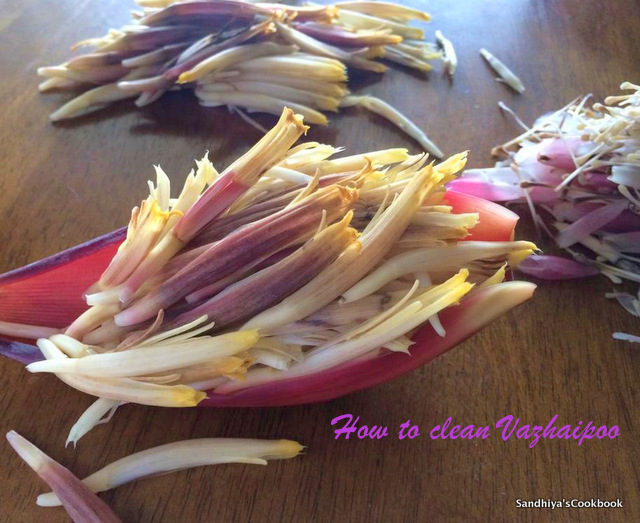 But cleaning banana flowers is such a painstaking process and also many beginners are not aware of this, so this post might useful for all the beginners in cooking and experts this post is not for you :-) but if you're willing to take a look on how i clean my vazhaipoo/banana flower, you're more welcome. At one time, when we were in hosur and i was still a beginner in cooking then, bought a vazhaipoo, called Amma & asked about the cleaning method and did all the cleaning, it took around 2 hrs. Once finished cooking them, i had noticed that it had a strong bitter taste and wondered why it had such a bitter taste, then again called Amma, she told that very rarely some vazhaipoo/banana flower has strong bitter taste(mild bitter taste is normal) and it's not advisable to consume them. Later i threw them in trash with heavy heart. So always taste a bit of raw florets, if it doesn't have any bitter taste, proceed cleaning them, else discard them. Lesson learnt that day !!! Ok, now it's time to check out the cleaning method. 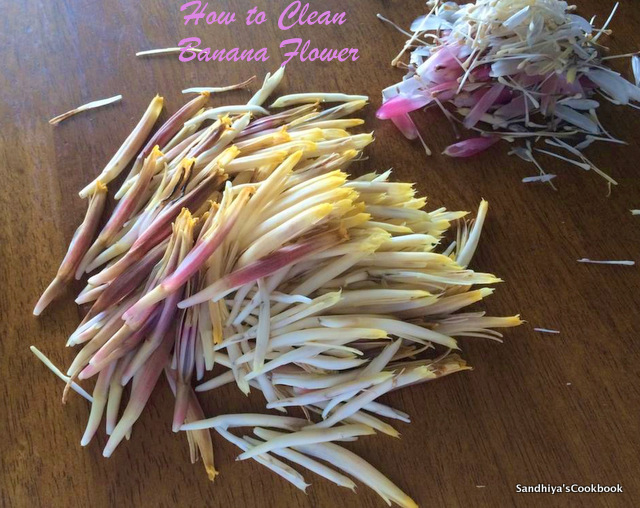 First take the banana flower, peel the first layer of petal and you can see the banana florets inside, remove them and place it on the plate. Do the same for next couple of petals. Next take one flower in your hand and inside you can see a stamen(the one with round head ) and a transparent layer. Remove them and discard it. Similarly do the same for all the florets. As you go on, the florets became smaller in size inside. At that stage, there is hardly any transparent layer, so just remove the stamen alone. 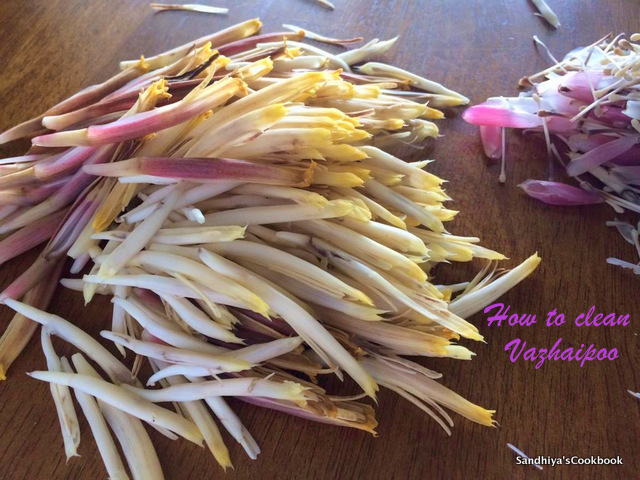 At one stage, you find it hard to remove the petals, at that stage, don't remove the petals, you can used them as it. Just remove the stem from it and chop them along them with florets. That's it, now it's ready to chop and cook. Your hands may have dark stains while cleaning. To remove that, just apply some coconut oil on hand after cleaning , rub it with tissue paper and wash it with hand wash or you can use the hand gloves to avoid staining. Banana florets becomes dark when keep it outside for long. If you're not cooking them immediately, put them in butter milk, it helps to become dark.